The first arc comes to a crazy climactic end! What have Fantomex and Cluster been up to while Bishop has been killing the rest of X-Force? Interior Art- The one good thing that elevates a mediocre book to average is the art courtesy of Ron Garney carry the heavy weight of the weak story on its shoulders and man does it rise to the occasion. I particularly like how Garney renders the astral plane/mindscape of Bishop. The bright glowing orange energy that Bishop wields is also quite nice. Cover- The Alternate cover featuring Storm and Puck is a better visual than the standard but not by much. Psylocke and Spiral- So a broken Spiral lost her new “reason” for living, Jinny who she assume has been killed by Bishop. While Psylocke hates Spiral for what has been done to her in the past there are parallels that can be drawn between herself and Psylocke. Sure Spiral helped to mix and switch her mind with the Asian assassin Kwonnon thus making her the woman she is now, the process itself was a combination of passing through the seige perilus, magic and technology at it’s very worst. Spiral meanwhile in the human guise of Ricochet Rita was abducted by mojo, driven mad and cybernetically and biologically modified and used by Mojo to do many unspeakable things including but not limited to what was done to Psylocke. In many ways these women are far more similar than they are different. 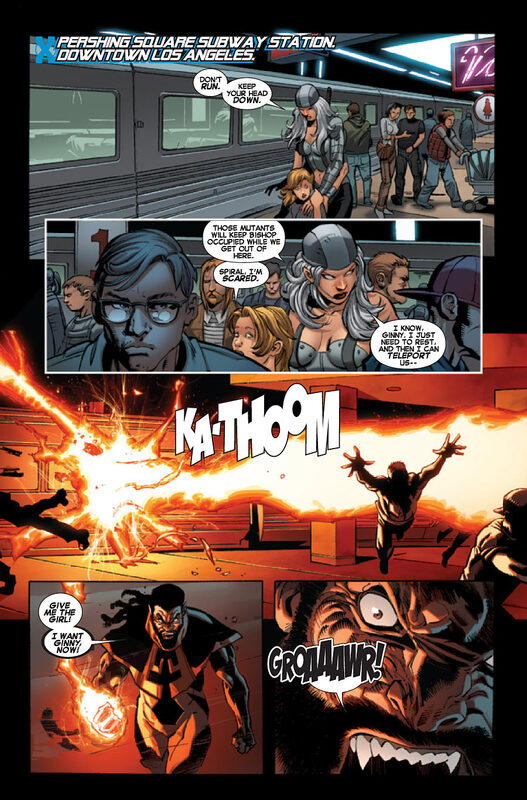 For this reason I think Psylocke faltered in killing Spiral after Jinny was “lost/killed”. One of only two good reasons to read this opening arc is that this issue convincingly paints Spiral as a woman who is worthy of redemption thus justifying her attachment to this team. Action- Well the story may have lacked any real substance but there was glorious action from start to finish. Black Hero- Storm is here. Bishop is also here. WTH- Ok so let’s see if I get what has happened in this opening arc. Bishop serves as a “vehicle/vessel” to transport this revnant psychic entity across time so it can take possession of the psychic Jinny to enhance its own powers. Once it has her it vacates Bishop’s body and disappears. So the opening was just that……seriously! Black Hero- Storm is here but she does nothing worthwhile besides hug Psylocke which is typical of their friendship but arriving at that hug was very forced and unnatural. Fantomex- I’m not impressed by what’s being done with Fantomex * 3, it was amusing at the end of the last X-force run but seems inconsequential and pretty damn lame. Wherever this is going, it isn’t there yet and I’m not sure I’m sticking around to find out. Ninja- They keep referring to Spiral as a Ninja but as far as I can remember she was always a sorceress…..why is she labeled as a ninja all of a sudden? Weird…..
Cover- The Fantomex twins are on this cover look cut and pasted on a bland background. 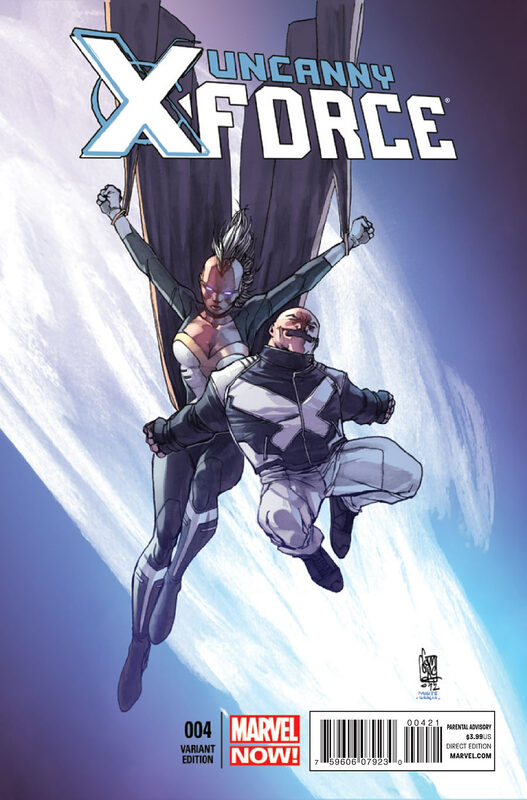 Uncanny X-force is underwhelming me at every step.